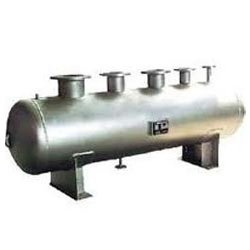 We are engaged in offering supreme quality Steam Header & PRS that is applied in oil & gas industries for controlling the pressure of the steam flow. 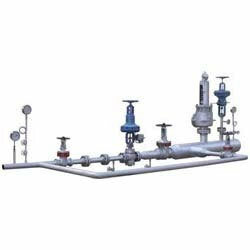 These have vital usage in these industries as to obtain the accurate and precise output, these equipment help in holding the pressure of the steam as per the requirement of the clients. These are developed on the world parameters and under the supervision of qualified engineers. These are designed using highest grade material that helps in obtaining maximum output. The technologically designated Steam Header is ideally used to receive steam from one or more boilers and hold it under immense pressure. Here, the downstream equipment receives the stored steam on demand. The header capacity is determined by client’s configurable dimension. We use fines raw material in developing the product that go through several international checks and verification before being sent to the market. We are offering quality tested Pressure Reducing Stations (PRS) that helps in assuring the accurate consistent downstream reduced pressure. Here, we use flash steam from individual extraction points in the medium pressure range of stream turbines, which avoids disruption in the overall thermodynamics of the power station. It is caused by large extraction quantities and the fact that the steam characterizes defines by turbine circuit do means of a corresponding system. In our Steam pressure reducing station the self actuating pressure control takes place by means of a special control valve that is the pressure reducing valve and it gives more latent heat, which is heat used in industries equipments in lower fuel consumption.